Hire Smart. Hire A Good Employee. A Good Employee was formed to give employers peace of mind when making a hiring decision. Our employment background screening solutions are the easiest to read and understand in the industry. We use an extensive network of databases to provide a comprehensive report. Order one of our bundled packages for an instant report or contact us and we’ll create a custom solution that fits your company’s needs. With over a decade of experience, you can trust our FCRA compliant reports will help you hire smart. 00:1:13 2015-5-20A Good Employee was formed to give employers peace of mind when making a hiring decision. Our employment background screening solutions are the easiest to read and understand in the industry. WATCH OUR VIDEO 00:1:13 2015-5-20A Good Employee was formed to give employers peace of mind when making a hiring decision. Our employment background screening solutions are the easiest to read and understand in the industry. Know exactly who you are hiring. Checking for social security number fraud and verifying a job applicant’s current and past addresses is an integral part of background screening. A thorough criminal background check is crucial for workplace safety. 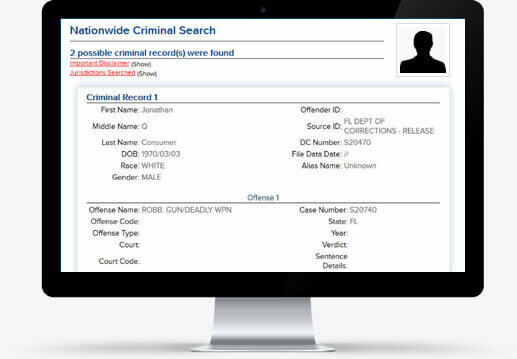 We run instant and repository criminal searches at the county, state, and federal level. We use a nationwide database that captures more information than a criminal county search alone. Help to maintain a safe workplace and create a safe environment for customers. Save time verifying employment dates, previous job title, salary information, and rehire status with our employee background checks. We contact previous employers or authorized agents for you and call references to provide a complete resume check. Education is one of the most commonly falsified items on a resume. Stay alert and check school attendance, graduation date, degree, and GPA to make sure you are hiring a qualified individual. A drug-free workplace has an overwhelming positive effect on overall environment and employee productivity. We provide custom drug screening before and after an individual is hired. A Good Employee features a streamlined portal that makes it easy to order and review employee background checks. Our intuitive system keeps you consistently updated via email and allows you to view real-time status updates in your account dashboard. 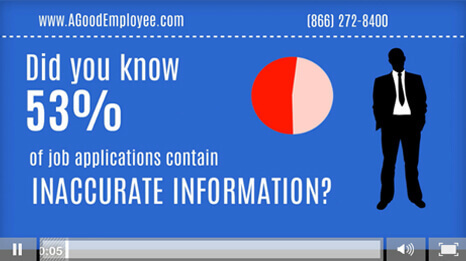 The reports you’ll receive are easy to understand, giving you the clarity you need when making a hiring decision. You’ll also have peace of mind knowing that our reports are compliant with federal and state regulations. Experience more efficient and consistent hiring, starting with A Good Employee’s background screening solutions. I’m so glad to have found A Good Employee. Ordering reports with them has been super affordable and simple. They’re also always available to answer my questions. My property management company is growing and we knew we needed to start thoroughly checking backgrounds of employees, especially those visiting client properties. By using A Good Employee, we have found peace of mind and we know our properties and tenants are safe. Unfortunately, people aren’t always honest on their applications. A Good Employee not only helped us with providing easy to read reports, they guided us through tricky situations. It’s great to know they’re there to help!